Below are some biographical details. My main home page is probably more interesting. 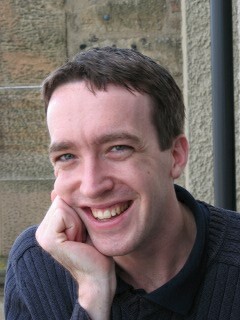 Iain Murray is a reader in Machine Learning at the University of Edinburgh. He moved into Machine Learning from Physics after taking David MacKay’s undergraduate course in Cambridge. He obtained his PhD in 2007 from the Gatsby Computational Neuroscience Unit at UCL, under Zoubin Ghahramani. He was a commonwealth fellow in Machine Learning at the University of Toronto, before moving to Edinburgh as a lecturer in 2010. He was made a reader in 2016. His research interests include building flexible probabilistic models of data, that can be applied widely: to cosmology, images, neuroscience, perception, speech, sports, text, and beyond. Iain has developed several Markov chain Monte Carlo (MCMC) and neural methods for performing inference in these models. Iain has been a program chair for ICLR (2018), publications chair for ICML (2017, 2018), and an area chair several times for AISTATS, ICLR, ICML, NeurIPS, and UAI. Shorter version: Iain Murray is a reader in Machine Learning at the University of Edinburgh. His research interests include probabilistic reasoning using Machine Learning, Density Estimation, and Markov chain Monte Carlo. Animated short: There is a high-level cartoon sketch explaining a part of my research interests.